After completing Cape Epic 2005 and Cape Epic 2006, for some insane reason we did it all over again for the 3rd time and the Amabubesi status. We made it again! What a race, we had an absolute blast. 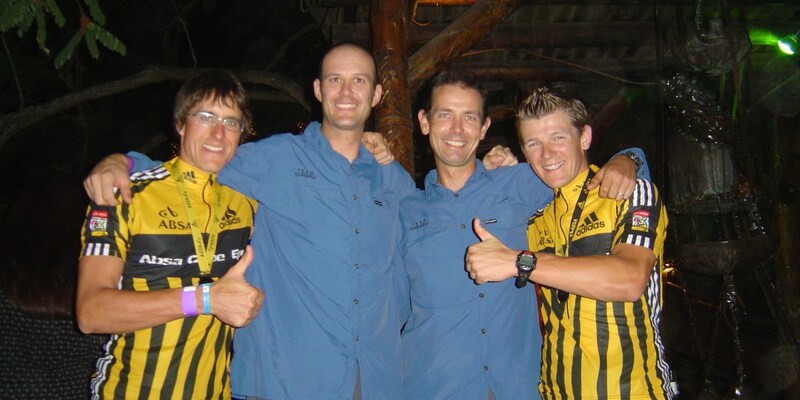 Absa Cape Epic 2007 was the best yet and we were lucky to be part of it. The route was brilliant with huge variation and some really tough climbs. After day 3 we thought we were dead but we lived to tell the tale. Subaru South Africa once again sponsored us for the build up and the actual 2007 event. Subaru was very impressed with our 2006 sponsorship and the return on investment that they received from our unique marketing offerings. Once again we rode Raleigh bikes as they had proved to be truly reliable and the support from Raleigh was exceptional. 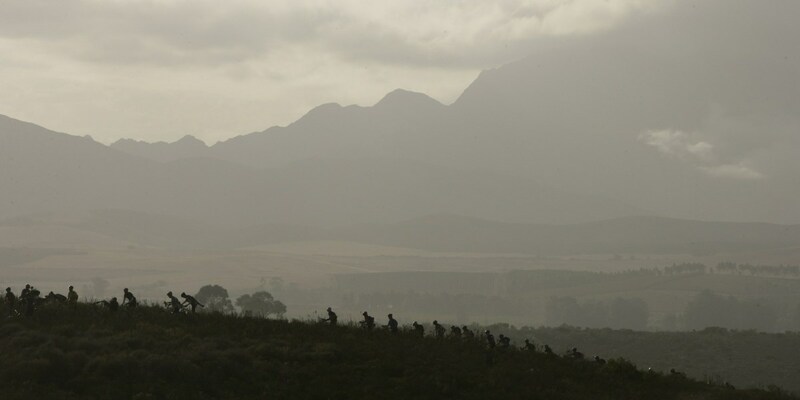 See below for a full Cape Epic 2007 Race Review and Report. The start today in Knysna was perfect with great weather that continued the whole day. It was a great days riding. Most of the route was climbing but there was great variation and awesome views. The first 40km to water point 1 was on forestry roads firstly through the Knysna forest and then some of the commercial forest. We followed some awesome contour paths rolling through the forests with twists and turns. With a bit of momentum it was good going. There were really 3 big climbs that we tackled today, the first just outside Knysna up Simola and into the forest, then the Prince Albert pass, and then lastly the Ou wapad into Uniondale. It is amazing how many faces are recognisable from previous epics, most of them looking leaner and meaner than before. We decided to start faster than any of our previous epics to try and get some time in the bank and get a good start position. We rode at just under 80% of max heart rate, previously we had stayed under 70%. We found the pace comfortable and were happy with our ride, although the climbing was hard on the legs. The last section on die Ou wapad was a highlight with some nice technical riding and a speedy technical decent. The decent unfortunately claimed one of our tyres as I punctuted at the bottom with a sidewall cut just 2km before the finish. A quick repair with a tyre plug and a new tube had us on our way again. We finished to a festive atmosphere at the school grounds in Uniondale with a 5:34 ride for the day. Our support crew (the loving wives Candice and Belinda) had found a nice shady spot on the grass behind the chillout zone. We spent the afternoon cleaning and checking our bikes, eating and just resting in the shade. We both felt good and looked forward to our massage as both of us had rather sore legs and we wondered how we would feel in the morning. Checking the results that evening we were very happy to find ourselves in the B seeded group, much better than we had expected. The challenge would be to stay there and slowly improve our overall time. It was the first of many chilly starts, but with the prospect of a hot Karoo day ahead we just grinned and bared it. The fast start out of Uniondale on the tar and the rest of the first 35 km wizzed buy. Humming tyres on the tar and huge dust clouds on the dirt roads brought home the epic experience as we settled in for a hard days riding ahead. We turned into Kamanassie and started a brutal ascent with some steep sections that had to be walked, all leading to the “stairway to heaven” an unrideable loose rocky section that had to be walked up with your nose scraping the ground. The descent was hectic and just barely rideable with a lot of concentration, so there was no time for resting there. My Raleigh RDS 9 with the rear shock unlocked loved this section while the hardtails were seen picking lines and dodging ruts, the full sussers just motored down. This 30km section took us 3 hours and left us very drained for the last 50km back. It turned into a long drag especially for me, and we were both completely exhausted when we arrived in Oudtshoorn. The finish was awesome again and we spent the afternoon under the shade next to the finish line. Many teams dropped out missing the 10hr cut off time that was strictly enforced this year. This was one tough epic day. Turns out we had a good day in comparison to others so we were still in it although we were starting to wonder how we were going to keep it up for another 6 days. For the first time both of us started feeling slightly nauseas and lacked appetite, but we ate anyway knowing that we had to. The massages saved us again and by the morning our legs were feeling ok.
Dust, dust and more dust. Once again our eyes were burning from all the dust picked up by the big bunches, bloodshot eyes would be all over the camp later in the day. I felt flat in the beginning as we rode through a windy rocky jeep track in a nature reserve, I just couldn’t get going, but Al was going strong. We passed Tom Ritchey a couple of times as he and his Rwandan protégé battled with punctures on the harsh African rock and bush tracks. By the first water point I was feeling a bit better and as we left we got to the first climb, Fiellie’s Folly, that required some walking due to the excessive gradient. We managed to ride most of it as others walked, the power strokes on the steep gradient took their toll and our legs burned. There was a jeep track decent followed by a bit of gravel road to recover before the next climb. It was the second climb of the day up the Calitzdorp crusher that was the real killer, wether you walked or climbed you would have struggled. Again we rode most of it to avoid the walking, but paid the price later. The last nasty surprise for us was the 3rd big climb of the day up Huis Rivier pass on 8km of tar, and it was the nail in the coffin. It was hot and draining, we suffered and got passed by many teams. Then there was still 35 odd kilometers to the finish on undulating roads with an upward gradient that never seemed to end. Eventually we rode into Ladysmith completely drained. This was one of the toughest climbing days and toughest epic days yet and after the previous 2 days it was definitely the hardest start to the epic yet. After almost 7hrs on the bike we struggled to recover and battled to eat and drink our recovery food as we suffered with lack of appetite and nausea. We visited the Polar guys that afternoon to download our HR data and had a good chat to Peter Figg from Polar. Despite feeling so tired and exhausted we were well on track with our top 100 overall and top 50 mens goal. Our HR graphs were the proof that we had been riding within our limits as we tried to stay under 80% of max HR, we were achieving this despite having just completed 3 of the toughest climbing days in the epic ever. It meant that we had managed to limit the damage and make it through these tough days without over doing it. It was amazing to see what the small 10% increase in effort from 70 to 80% of max heart rate had done to our fatigue levels. But as Peter explained the exponential relation between exertion and fatigue meant that we were feeling the large effects of that small increase in exertion levels. The Ladysmith location was really in the middle of the Karoo with no grass in site and just barren landscape, we really were in the middle of nowhere. But with some more good massages and some good dinner we started to feel better. Sleep was also improving as we started to get used to the camp vibe. Stories of friends and some pros who had not made the cut off hit home the reality and harshness of this event. We were starting to doubt our ability to maintain a hard pace, but despite feeling so tired we were still well placed and it gave us encouragement. Day 4 was billed as a recovery day and an easier day but we know that there are no easy epic days. Once we got going in the morning we soon realized that this was not going to be an easy day. There was half the climbing of the days before but there was twice the sand so the going was stop start. With plenty of jeep track it made for great variation and interesting riding. It was a relatively fast day with a technical finish so we took it easy anticipating the end. We finished strong and relatively early in under 5 hrs. We had a great recovery time under a tree on a grassy field, with our appetite returning we munched on salt and vinegar Pringles to satisfy the growing salt craving. For the first time we started to feel good and got a feel for the final 4 day stretch to the finish. The Barrydale location was very scenic but the camp was a bit disjointed with the showers on the opposite end of the camp. This was our best day by far, the riding was awesome and we felt great. It was just one of those great days to be on a bike. A short tar start lead us through orchards and farm tracks and scenic mountain roads. We held back a bit at the start anticipating two rather large climbs and a technical finish again. The climb up to Op De Tradouw was on single track used by a local quad adventure company. It was tricky and steep at the start , but became very rideable towards the end and the views were brilliant. At the top we rode on some jeep track for a long way before descending onto some secondary roads. The second climb of the day, Wolfieskop pass was close to the finish and was steep and just rideable. We felt really good at this stage and powered up the climb comfortably and then rode hard to the finish along the technical jeep and single track. We passed many teams who had gone out hard in the morning and were now looking for some extra energy. The finish at Montagu was on the tar after a long downhill which made for some exciting sprint finishes. At Montagu we took some timeout and joined Candice and Belinda at their guest house next to the river in Montagu. We had another good rest and an afternoon nap. That evening after our massage we went out for Pizza and spent some time with the ladies who were doing such a brilliant job of keeping us motivated and happy. We went to bed well fed, rejuvenated and ready for the final 3 days. This route was very familiar to us having done the exact same one in 2005. We remembered a fast tar section followed by a seriously technical climb that required walking and a sting in the tail just before the finish. As usual there was a quick tar start out of town, but soon we were onto some rocky jeep tracks. We were cautious in the first half of the day wanting to save some for the end knowing that a blast down the tar could cost us at the finish. The rocky climb did not seem as bad as last time, with a short walk at the start and then a little bit more towards the top. We had passed Christoph Sauser earlier with some flats again. But he caught us on the climb, and pedaled past as we struggled to walk over the rocks. This was the Cape Epic, out in the middle of nowhere watching a world champ biker thread through walkers across unbelievable technical tracks, a pleasure to watch. After eventually reaching the top we had the fastest descent of the epic with some guys hitting 80km downhill on sketchy tar and dirt sections. A couple of riders miscalculated some of the tar dirt transitions and had some bad falls. The rolling hills to the end sapped our energy and we had just enough left for the final climb. It was about 5km long up to the mast above Villiersdorp and it was over a hard bumpy surface thanks to churned up ground from many cow hooves. Then a speedy decent into town along the water canals was exhilarating as we bolted for home. We rode in under 5hrs again so we were happy to be able to have an afternoon of rest to recover. Our time this year was 40mins better than in 2005, yet our position in the field was exactly the same. This was a clear testament to the increased competition and level of the riders since the 2005 epic. Every year the pace and level in this race has increased. Our afternoon spot was on someone’s pavement, were we watched the goings on of the race village as riders, crew, supporters and passersby kept us amused. The local slap chips shop did a roaring business and we were there helping them along. By now the legs were starting to feel better and the hammering of the first 3 days seemed to be something of the past. Massage, dinner and sleep saw us ready for another big day. This was going to be a tough day, long hard and a bit unpredictable. With a beach finish we had something to look forward to, but we had to work hard to get it. It was a blistering tar start again, followed by rolling hills were we settled in and rested a bit. But Groenlandberg came sooner than later so we had to start digging to get the climbing legs going again. We climbed up Groelandberg and turned off before any of the really ugly stuff started as we took a jeep track towards Lebanon. It was tough going on this rocky undulating section, but we did well and moved up a bit. The long descent took us to the second water point after which we crossed under the N2 and headed into the Lebanon forests. Another casualty lay on the ground just after the water point with a broken collar bone, concentration was critical all the time otherwise you could go down. The climb in Lebanon was undulating and we found ourselves on another tar climb, which should be easy but somehow proved to be sapping on the legs. At water point 3 we had reached the top and then it was down again into Koegelberg Reserve on a rocky jeep track that would take us along the Palmiet river and into Kleinmond. The cool breeze had disappeared in this little valley and it was hot and slow going. The undulating track was very rocky with short sharp climbs that require power and balance, a rare luxury after 100km of riding. We thought we would never get out of the valley but then the a little house appeared and the road surface changed to gravel jeep track and then just gravel, then we popped out onto the tar and now it was just 5km to go. We rode as fast as we could. The last kilometre was singletrack on the beach, stay on your bike was hard work, then across bridge and onto the finish line. We did it again another good day, 5:24. Turns out we did better than expected and got our highest finish of the week with a 66 overall and 45 in the mens, we felt great. Falling asleep with the sound of the sea was a great way to end the day. A late start today which meant a bit of a sleep in, but it also meant that we would be out in the heat of the day. There was a bit of nervousness the night before and at the start, as we had realized that this was not going to be an easy cruise in day. The leaders were still in a tussle for overall winner and down the field everyone was having their own little race, so it was either preserve your lead, get home in one piece or give it horns for the last day. 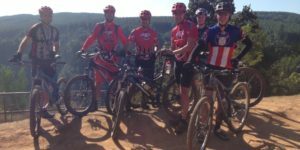 We had been riding with ABSA team Ockert and Henry, Wheelthing Andre and Angus, Nicholas & Clinton from Wiley X Eyewear Cyanosis as well as a couple other teams like the Swiss bike brothers and the Dunlop dudes. We went back out along the Palmiet river track, with fresh legs we gunned it way faster than when we came in the day before. But with all the climbing ahead, the fast start would turn out to be a bad idea. The fast downhills from the day before had turned into uphill slogs as we made our way up to the top. A quick water stop and then there was some rest with a decent through the forest after which we popped out onto a tar pass and headed up again. Then some tracks through the Grabouw orchards and another climb up towards the mountains and the N2 crossing. It was getting hot and I was desperate for the water point. We stopped and re-fuelled then crossed the N2 and headed for the compulsory portage. It was some more climbing up to the portage and it became evident that the distance and climbing for the day was going to be just a little bit more than was promised. An in so doing keeping the spirit of the Cape Epic alive where you take nothing for granted and expect the unexpected. The portage was actually quite welcome and a chance to rest a bit, take in the scenery and reflect on the last day of the epic. It was also the first sighting of the finish area and you got a distinct sense of “ I am nearly there…” But there were still two nasty little climbs that sapped the last bit out of the legs, a bit like squeezing a squeezed orange, just drips came out. The best sign board of the whole Epic, that last 5km to go sign. Suddenly a rush of power and we bolted for the finish again. The Lourensford finish was spectacular, coming down the tree lined road and then onto the long lap around the field. It felt like we were floating, hundreds of people cheering. Finishing the epic for the 3rd time was just as satisfying as the first, a huge sense of achievement, suddenly you realize how difficult the task at hand has been but seeing it as little pieces made it achievable, but the final moment is huge. Al proudly took his Raleigh up onto the stage, worthy of a medal itself for carrying him all the way. We felt like heroes but meanwhile we were just a couple of average guys out having a blast riding our bikes. Thanks to Subaru for supporting us and believing in us and making this possible. Candice and Belinda our support team were the absolute best, they always had cool relaxing spots for us to sit and recover and organized food and drinks for us and gave us love and encouragement. Well there is only a mild feeling of depression after it is all over. 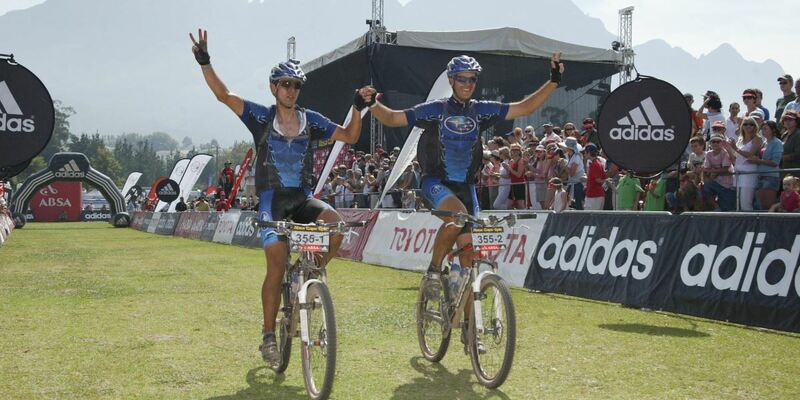 The 2007 epic was intense for us, with our focus on doing well we were trying to ride hard everyday. It took its toll mentally and physically. The pace was incredible and definitely higher than any of our previous epic rides. So now to have some peace and quiet afterwards is actually quite welcome. Looking back it was a great event, the route really was quite spectacular, varied and interesting. The amount of technical riding was amazing and it made for very interesting days out. Favorite sections were those killer climbs on day 3 at Fiellie’s Folly, the start of day 4 through the orchards, that Palmiet river rocky jeep track, the descent off Kamanassie, the descent off the top of the climb on day 6, feeling strong at the end of day 5. Great moments were looking up from my Ritchey stem to see Tom Richey riding the single track in front of me, checking out the pros bikes in the motor home park. Watching Christoph Sauser pedal past me as I stumbled over a practically un-rideable climb and then catching up to him for a split second at the bottom of a decent before he and David George cruised home after taking it easy that day. 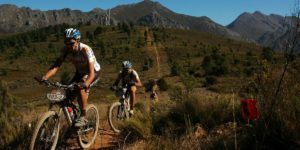 Favorite stage locations were Uniondale, Montagu and Kleinmond. Will we be back………………. probably, how can you not be part of one of the greatest races on earth?